A club of Valencia’s stature needs a strong structure. The future of Nou Mestalla remains unsteady. For anyone reading who follows me on Twitter, you’ll know how much I love Brutalist architecture. When I found out about Valencia’s Nou Mestalla, I was in awe of its structure… except the exterior I saw was actually its interior. Plagued by financial problems and accidents, construction of the new stadium had stopped in 2009 and hadn’t been restarted since. Only time will tell when Nou Mestalla will be completed. 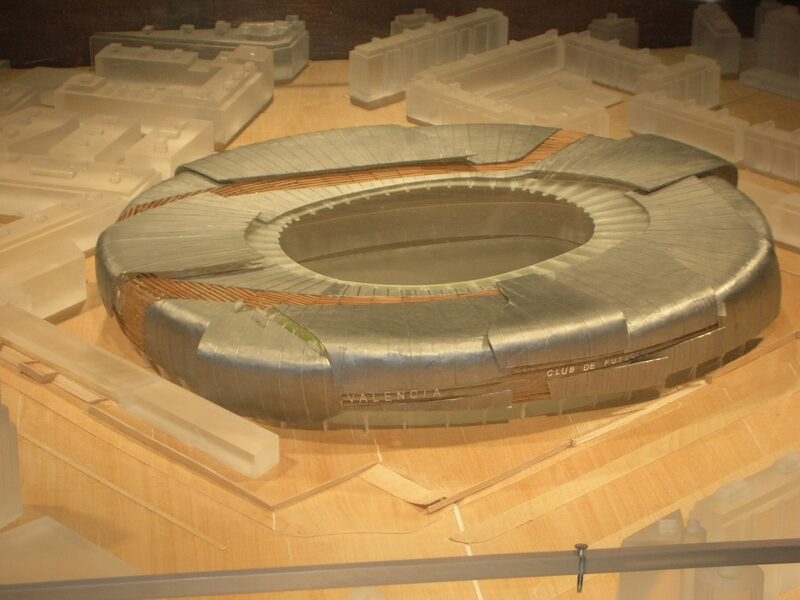 Plans for the new stadium were unveiled by Juan Soler in 2006 with a short film. Work started 9 months later with a 2-year completion window. In 2008, four construction workers were killed when scaffolding collapsed on site. Due to financial difficulties, work ceased in 2009 with the stadium incomplete. Two more years passed before a new deal was negotiated to complete the stadium. This also involved transferring the current Mestalla stadium to the bank but the deal subsequently collapsed. In 2013, a redesign was proposed by Fenwick Iribarren Architects, reducing the capacity to 61,500. But this was all in vain as reconstruction never took place leaving the stadium’s future in tatters. Matters on the pitch weren’t as questionable. A 4th place finish in La Liga and last 8 finish in the Champions League in 06/07 was followed by a Copa del Rey win the following season. 09/10 involved a Europa League run to the last 8 and the first of two consecutive 3rd place finishes. This was all in spite of serious debt problems, which lead to the sales of David Villa, Juan Mata, and David Silva. It wasn’t until 2014 when Peter Lim gained ownership of the club that the money problems began to dissipate. The 2015/16 will be known best for Gary Neville’s aborted tenure between December 2015 and March 2016. Pako Ayestarán took over but was sacked in September after four straight defeats at the start of the 2016–17 season. Cesare Prandelli replaced him but left in December. Valencia’s sporting director Jesús García Pitarch also resigned and caretaker manager Voro pulled them out of relegation danger, finishing 13th. Valencia’s dominance in the late 90s and early 00s are now a thing of the past. Money problems and boardroom troubles have affected the club in recent seasons and it’s anyone’s guess as to whether their Nou Mestalla will ever be completed. Just this month, the club announced new negotiations with the city’s council to “renew the project and complete the building process” (linked article is in Spanish). But these “new” announcements are old news. The newer design has 20,000 fewer seats than the original plans. As we speak, Valencia find themselves in second place in La Liga, 4 points behind Barça and one of only two clubs still unbeaten (the other being Barça). This kind of form may well keep spirits up as the future of Nou Mestalla remains anything but concrete.